Imperial Towers is another ongoing residential project approved by RDA and marketed by HIRTRC. Imperial Towers offers 2 bed and 3 bed residential apartments, booking is open for both sizes of apartments on first come first served basis. Apartments can be booked in easy installments and cash payment. The booking for 2 bed and 3 bed apartments starts from 10% down payment and remaining will be paid in 3 years easy installments. Moreover, furnished and non-furnished apartments are also available for booking. 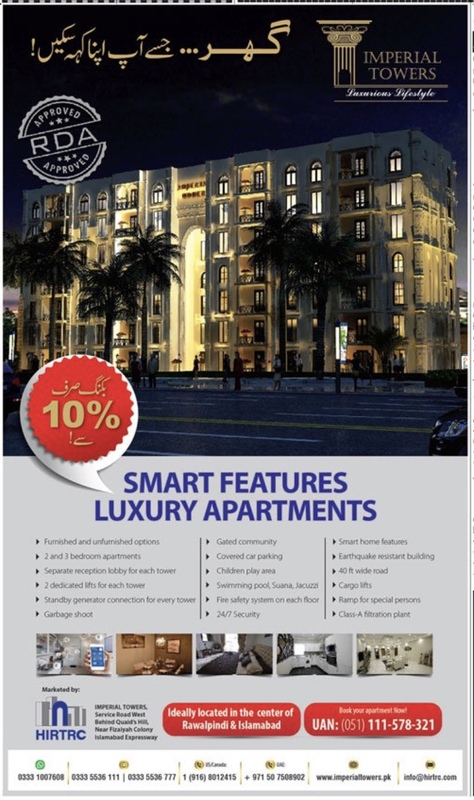 Imperial Towers is located at main Islamabad Expressway. The project is also near to Fazia Colony and few minutes drive away from Benazir International Airport. Separate car parking area for residents. 2 lifts are dedicated for each tower. Standby generator for each tower. Swimming pool, kids play area & sauna. Fire safety system on each floor.